Florida's Everglades contains both temperate and tropical plant communities, including sawgrass prairies, mangrove and cypress swamps, pinelands, and hardwood hammocks, as well as marine and estuarine environments. Everglades National Park is the largest remaining sub-tropical wilderness in the continental United States and has extensive fresh and saltwater areas, open Everglades prairies, and mangrove forests. 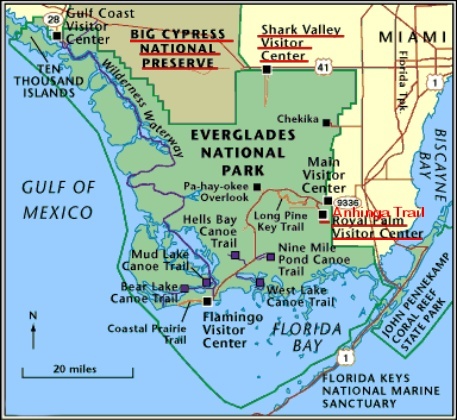 The boundaries of Everglades National Park protect only the southern one-fifth of the historic Everglades ecosystem. In its entirety, this massive watershed boasts a multitude of habitats and wildlife thriving in a unique assemblage amidst the subtropics. The area boasts rare and endangered species, such as the American crocodile, Florida panther, and West Indian manatee. Abundant wildlife includes rare and colorful birds, and this is the only place in the world where alligators and crocodiles exist side by side. The park is 1,506,539 acres (606,688 hectares) in size. The Everglades is mild and pleasant from December through April, though rare cold fronts may create near freezing conditions. Average temperatures in winter - High 77°F (25°C); Low 53°F (12°C). Summers are hot and humid, with temperatures around 90°F (32°C) and humidity over 90%. Afternoon thunderstorms are common and mosquitoes are abundant. The Atlantic Hurricane Season is June-November. Tropical storms or hurricanes may affect the area. Average Rainfall: 60 inches (152 cm) per year. The rainy season is June through October (mosquito season coincides with the rainy season). Once, water flowed freely from Lake Okeechobee to Florida Bay, a "river of grass" 120 miles long and 50 miles wide, but less than a foot deep. In this flat landscape, even a few inches of elevation meant the difference between wet marsh and dry ground. Today, the Everglades is an ecosystem in danger. Canals and levees capture and divert its water for human needs, including drinking water, irrigation, and flood control. Often, too much water is withheld from the Everglades during the wet season, or too much is diverted into it during the winter drought, disrupting the natural cycles of feeding and nesting which depend on these patterns. Sometimes the water is contaminated by pollutants. Faced with loss of habitat, disruption of water flow, and the invasion of non-native species, many animals have declined dramatically in number. Some have virtually disappeared. These MISR nadir-camera images of southern Florida were acquired on October 18, 2000 (Terra orbit 4446). The view on the left includes Daytona Beach near the top and the Florida Keys at the bottom. Orlando appears as a grayish patch near the top of the image, just to the east of the greenish Lake Apopka, Florida's fourth largest and most polluted lake. On the coast is Cape Canaveral, home of the Kennedy Space Center. The large body of water in the middle of the land area is Lake Okeechobee. On the western (Gulf of Mexico) coast, Charlotte Harbor and Fort Myers are visible. Along the eastern (Atlantic) coast, partially obscured by clouds, are Palm Beach, Fort Lauderdale, and Miami. Further to the east, the shallow waters and reefs of the Little Bahama and Great Bahama Banks appear in striking blue and green colors. 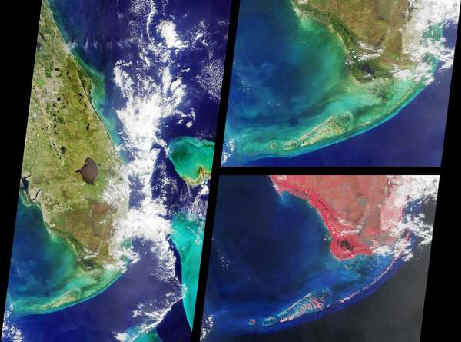 The two righthand images show the Florida Everglades and the Keys in more detail. 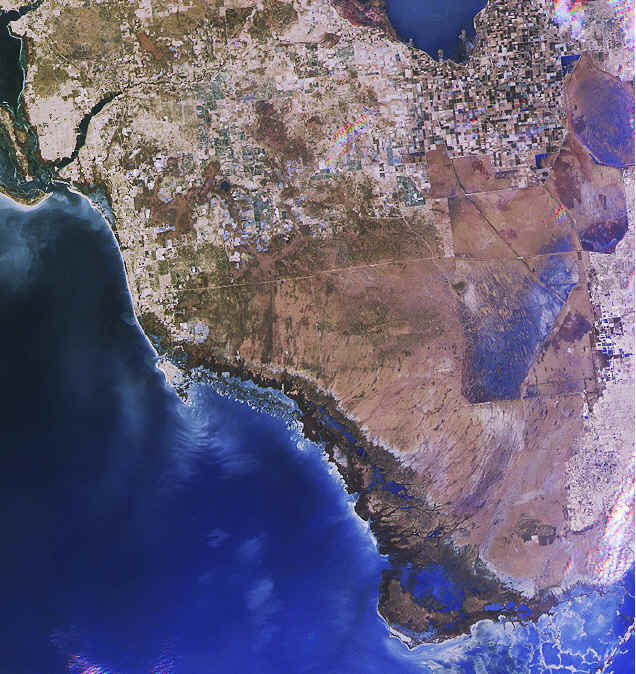 Like the lefthand view, the top image is a natural color composite of blue, green, and red band imagery. On the bottom is a false color composite comprised of green, red, and near-infrared data. Near-infrared light is invisible to the human eye. The high reflectance of plants in this part of the electromagnetic spectrum, displayed here in shades of red, is the basis of many satellite-based techniques for detecting and characterizing land surface vegetation. Few wetlands demonstrate dilemmas of development more starkly than Florida's Everglades. Since 1920, drainage to create farmland or housing has dried out half of the Everglades National Park, and left the rest heavily polluted. The Everglades' sawgrass fields, dry pinelands, "islands" of trees, and mangrove forests once supported over 600 kinds of animals and 900 of plants. In the past 50 years, pollution or water-flow disruption and complete drainage in some areas have disturbed or destroyed many habitats. Wild populations, especially of birds, have plummeted; the number of wading birds that nest in the national park has dropped by more than 90 percent. Recent surveys in the Everglades and within the Big Cypress Swamp indicate the presence of at least several hundred archeological sites within the interior of south Florida. Some of these sites proved to be substantial, and suggest more than just marginal or short-term use. Based on current data, it also appears that the sawgrass plains region south of Lake Okeechobee, now the Everglades Agricultural Area, was a transitional area used for canoe travel and small encampments by many tribes. The exceptions are earthwork complexes, some of which are known to be located on the western edge of the Everglades. These sites show a strong affiliation with the Belle Glade Area on the shores of Lake Okeechobee. Pottery remains found in portions of the southwest section of the Everglades Agricultural Area indicate influence from regions as far away as Ten Thousand Islands/Florida Bay on the southernmost end of the state. The settlement of South Florida, which has occurred since 10,000 b.c., has been chronologically categorized up until a.d. 1930. Paleo-Indian Period (10,000 b.c. to 8000 b.c.) — The Paleo-Indian likely lived with mammoths, bison, and other types of megafauna in arid climate conditions. With the extinction of these animals, the Paleo-Indian adapted to the changing climate and emerging wetlands and began to establish patterns of subsistence (deer and rabbit hunting, as well as marine life gathering). Archaic Period (8000 b.c. to 750 b.c.) — During the Post Glacial period, the sea level rose and diminished Florida’s land base, and the climate began to change. By 5000 years ago, cypress swamps and hardwood forests characteristic of subtropical terrain began to develop. The people of this period increasingly relied on shellfish and other coastal resources, as well as expanded hunting, fishing, and plant gathering. From the Early Archaic Period to the Late Archaic Period, advances were made in the shaping and use of tools and pottery. Remnants of the tools and pottery are valuable in dating these sites. The Glades Period (ca. 750 b.c. to a.d. 1500) — The Glades I, II, and III periods are dated and characterized by pottery types. During the Glades II and III periods, evidences of a thriving trade network is evidenced by a variety of exotic resources, such as lithic tools and ornaments. Historic Contact Period (ca. a.d. 1500 to a.d. 1750) — This period includes the arrival of the Europeans and their encountering of a thriving population of at least five separate tribes: the Tequesta in southeast Florida, the Calusa in the southwest, and the Jeaga and Ais along the east coast north of the Tequesta, and the Mayaimi near Lake Okeechobee. At the time of Spanish contact the Calusa maintained political dominance over these groups. It has been estimated that there were approximately 20,000 Indians in south Florida when the Spanish arrived. By 1763 when the English gained control of Florida, that population had been reduced to several hundred, which were reported to have migrated to Cuba with the Spanish (Romans 1962). Florida’s Everglades is a region of broad, slow-moving sheets of water flowing southward over low-lying areas from Lake Okeechobee to the Gulf of Mexico. In places this remarkable ‘river of grass’ is 80 kilometers wide. This image above is from the Multi-angle Imaging SpectroRadiometer show the Everglades region on January 16, 2002. Each image covers an area measuring 191 kilometers x 205 kilometers. This image above is a natural color view acquired by MISR’s nadir camera. 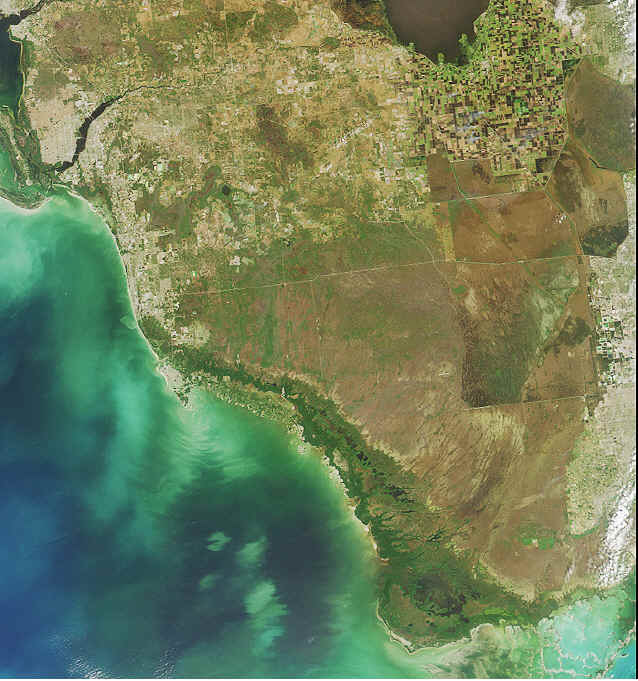 A portion of Lake Okeechobee is visible at the top, to the right of image center. South of the lake, whose name derives from the Seminole word for ‘big water’, an extensive region of farmland known as the Everglades Agricultural Area is recognizable by its many clustered squares. Over half of the sugar produced in United States is grown here. Urban areas along the east coast and in the northern part of the image extend to the boundaries of Big Cypress Swamp, situated north of Everglades National Park. This image combines red-band data from the 46-degree backward, nadir and 46-degree forward-viewing camera angles to create a red, green, blue false-color composite. One of the interesting uses of the composite image is for detecting surface water. Wet surfaces appear blue in this rendition because sun glitter produces a greater signal at the forward camera’s view angle. Wetlands visible in these images include a series of shallow impoundments called Water Conservation Areas which were built to speed water flow through the Everglades in times of drought. In parts of the Everglades, these levees and extensive systems such as the Miami and Tamiami Canals have altered the natural cycles of water flow. For example, the water volume of the Shark River Slough, a natural wetland which feeds Everglades National Park, is influenced by the Tamiami Canal. The unique and intrinsic value of the Everglades is now widely recognized, and efforts to restore the natural water cycles are underway.